Bernie Madoff’s Superyacht “Bull”, a bespoke Leopard 27M that was built to Madoff’s unique specification has been put up for sale. Bernie Madoff, the disgraced financier, was arrested in December 2008, over an alleged $50 billion fraud, possibly the largest swindle of the 20th Century. After pleading guilty to all fraud charges brought against him, he was sentenced to 150 years behind bars. 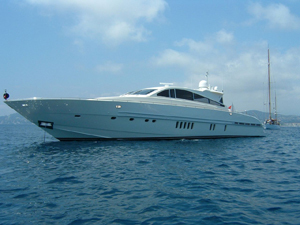 The last of Madoff’s Yacht’s “Bull”, a Leopard 27M Superyacht, was commissioned and purchased new by Madoff Securities International Ltd in April 2007 (List Price 6m exc. VAT). “Bull” was built by Cantiere Navale Arno, Pisa, Italy to Madoff’s unique specification, which includes Twin MTU M92 (2285hp each) coupled to Arneson Drives capable of reaching a maximum speed of 42 knots; impressive for a yacht of her size. We understand that the Captain has been with “Bull” from order date and was directly involved with her build at the factory. Accommodation comprising: 6 Berths including Owner’s Ensuite Stateroom, VIP Ensuite Cabin, Guest Ensuite Cabin, in addition there are 3 Crew Berths. “Bull” has only 320 hours use on her engines, underwent a full out of water maintenance in August 2010 and is ready for immediate use, currently lying in Gibraltar. To obtain additional images and specifications of Bull contact either Gordon Wyles or Simon Withall at Wyles Hardy & Co.